I came across a blog post entitled ‘Understanding Professional Thought Disorder’ – referring mainly to mental health professionals. Apparently Dave Lowson, a member of Survivors Speak Out, wrote the piece on ‘Understanding Professional Thought Disorder’ back in 1993. The blog post I came across is dated 2 May 2015 and was posted by Bibi Bushe (http://tallatrialogue.blogspot.co.uk/2013/05/understanding-professional-thought.html). 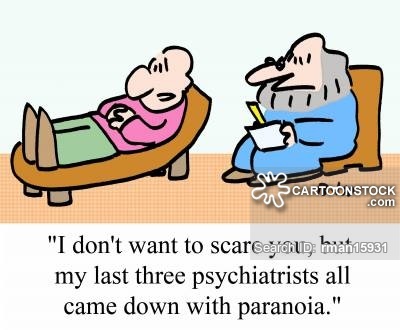 Dave Lowson’s piece is satirical but my personal (‘lived’ as we say in the trade) experience of mental health services and also my experience of doing ethnographic research on psychiatric wards in the past 15 months or so tell me that the piece in question describes rather accurately some of the mental health staff that I came across! What is Professional Thought Disorder (PTD)? Professional thought Disorder is very common, although it is only recently that the extent of its occurrence has been recognised and individuals successfully diagnosed. PTD is a condition that affects many professionals, but it seems to be particularly prevalent within the mental health field. The major characteristic of PTD is an assumption of intellectual or moral correctness or superiority, frequently held in spite of the presence of major contra – indications. However there is still great controversy about what PTD is, what causes it, and how it can be treated. What are the signs of PTD? Every person with PTD is unique, however it is useful to know what common symptoms to look for which may indicate the presence of PTD. Inappropriate affect/emotional rigidity; Sufferers often have major difficulties when it comes to dealing with their own and others emotions. For example; a pathological inability to acknowledge their own distress and a denial of vulnerability. An inability to display empathy to others in distress. A compulsion to analyse and compartmentalize the experiences of others, presumable to protect their own fragility. At the extreme these symptoms combine to create an impression of total depersonalisation. Impaired social skills and interpersonal functioning; Communication with others is usually characterized by an unusual rigidity. In particular the fundamental ground of human discourse, the acknowledgement of the other is frequently lacking. This often manifests itself in lack of common courtesy and impaired listening. Disordered cognition; Sufferers often display bizarre thought patterns. This can manifest in the following; Rigidly held beliefs (which are held to be “facts”). Such beliefs are not affected by empirical evidence from the real world. Asking strange questions which seem to have no relevance to the context within which they are asked (e.g. Asking someone who was in distress to count backwards from 100 removing 7 each time). Delusions of grandeur; Sufferers tend to see themselves as important, gifted and beneficent. A frequent delusion is that sufferers deserve to be trusted by others, prior to expressing any behaviour which would make trust appropriate. These delusions are maintained by hostile labelling of anyone who challenges these self concepts. One consequence of this is that the worth and abilities of the other is frequently unacknowledged. Negative transference and projection; A common feature is that the sufferer is unable to distinguish their own wishes and impulses from those people they believe themselves to be helping. This is assumed to be the reason why they so often “act out” this confusion by behaving in ways which provoke anger in other people and then punitively label this anger as a sign of pathology in that other. What causes PTD? This is a question which is causing debate, especially amongst mental health service users who are in a position to study this disorder closely. Undoubtedly much of its symptomatology becomes deeply ingrained in sufferers’ behaviour patterns as a result of negative socialization through professional training programs. Others however believe that these environmental factors merely mask a severe underlying personality disorder which is almost certainly genetically determined (although the precise mechanism of this organic fault has not yet been fully determined). How can PTD be treated? There are several barriers to treatment identified. Most sufferers do not, or are unable to recognise that they have a problem. This lack of insight is a major stumbling block to treatment. Much of the sufferers’ disturbed behaviour is positively reinforced by the surroundings they develop for themselves. The main harm caused by PTD is not experienced by the actual sufferer but by those around them. This limits the motivation to change. In spite of the above, treatment of individuals is being tried. At present the core of therapy is seeking to find the right balance between support and challenge to try to bring the above problems to the sufferers’ consciousness (and conscience). Results to date are mixed. There have been some successes; however, the people administering the therapy (largely mental health service users and ex-users) are becoming frustrated at the painfully slow rate of progress achieved through this approach. Ultimately it may be that PTD only responds to a limited degree on individual therapy and that an approach based on structural change will need to be tried. The first aim of this would be to limit the damage that people with PTD could cause to other members of society.